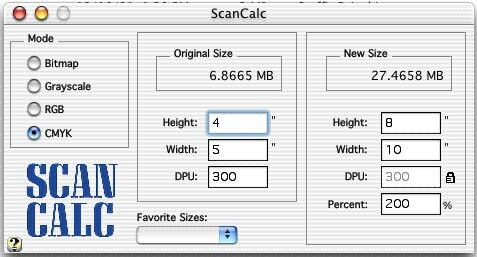 ScanCalc is a handy utility for determining the size of scanned images. It works similar to the "New Document" dialog in Adobe Photoshop®. 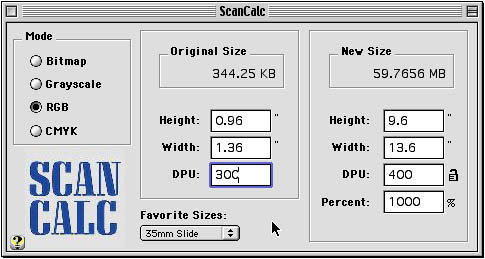 You specify the height and width of the original and the percent of enlargement/reduction and ScanCalc will tell you the disk space needed for the scan. This can be helpful if you're having a service bureau scan some slides for you and you need to know how many removable cartridges to send. It's also useful if you're concerned about image size and want to see the difference between scanning an image at 300 DPI versus 400 DPI (helpful if you're trying to get an image to just fit onto a Zip 94MB cartridge). 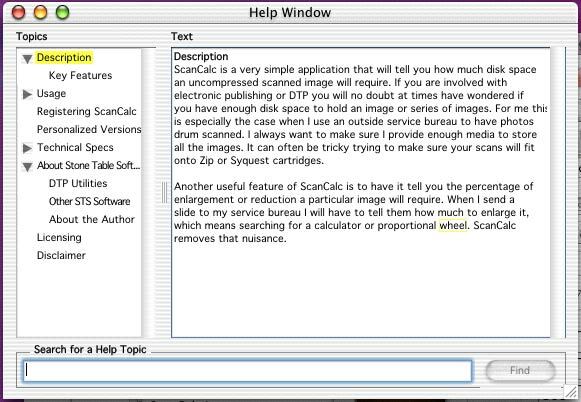 ScanCalc also functions as a proportional wheel: enter in a new height or width and ScanCalc will show you the percentage of enlargement/reduction. ScanCalc works with several measurement systems, including inches, points, and metric. Attention Service Bureaus and Scanner Operators! for you to distribute to your clients!